Everybody wants to be more self assured, secure, resilient and mentally stronger, so they can be more socially confident, get a better job, or achieve a personal goal. If you are not living up to your true potential or you feel as if you're stuck in your current mindset or situation or you find that you just cannot seem to move forwards or get the results that you want, no matter how hard you try. Then it may be, because you are holding some damaging limiting beliefs about yourself, you need to do some emotional clearing work or you have some unhelpful programming or bad habits that need changing or updating. Far too many, wrongly think that they are not good enough, they are not capable enough, they cannot handle certain situations or they believe that there is somehow something wrong with them. The only person who can pull you down, diminish you and decide whether you're good enough or capable enough is, you. You have limitless potential and ability, all you have to do to tap into your true powers is to believe in yourself and learn to let go of all negative emotional attachment. "The root of suffering is attachment." One of the best lessons that you can learn in life is, avoid at all costs, adding any negative emotional attachment to a problem, outcome, desire, previous experience or situation. Negative, emotional attachment will drain all your inner strength and power, emotional attachment makes you feel weak, powerless, disempowered, stressed and clumsy. One way to release emotional attachment, is to say so what, I couldn't care less, it doesn't bother me or stuff it (Or words to that effect). This does not mean that you should give up on a goal that is not going well or not bother trying to grow or better your life, it just means that you should release any emotional attachment, so you flip into the non resistant flow like state. Emotional attachment, cause a resistance to what you really want, which leads to more stress, anger, sadness, anxiety, frustration and disappointment. To develop your inner strength, to be at your most confident best and to get the results that you want, you need to be in the allowing calm emotions. We all have our perceived weaknesses, but you will gain nothing, by focusing on your weaknesses and flaws all the time, and when you keep focusing on your weaknesses, it just leads to more struggle and suffering. It is better to accept your flaws and weaknesses, and stop seeing them as weaknesses. Instead of convincing yourself that there is something wrong with you or you're not capable enough. A better approach would be to look at the area's where you could grow and develop your skills and work on these key area's, rather than focusing on what you think is wrong with you all the time. To begin building your inner strength and resolve, you need to start believing in yourself and your abilities. If you do not believe that you can, the chances are, you won't take the action steps or do the things that are required to achieve your goals and wants. You cannot achieve much in life, if you do not believe that you can do it, a lack of belief or fear of failure will prevent you from growing and developing your skills. Stress and negativity are the biggest things that drain your energy and sap your mental strength. In life there are no stressful situations, only stressful thoughts and responses, and if you can begin to change the way you perceive and react to your external circumstances then you will start to reduce your stress. One way of reducing your stress and anxiety is, every time you notice the onset of stress or anxiety, practice bringing yourself back to the present. There is only the present, and the present is where you can access all of your power, it is your safe haven and place of peace and serenity. You are a more powerful, creative, productive and intelligent person when you're grounded in the present moment and you're feeling, relaxed balanced and poised. If you want to be more confident, then you need to be poised and balanced and engaged in the now. Stress and anxiety are a pattern of behavior, where we react badly to our circumstances or our imagination, stress makes us stupid and weak, and it forces us to rush and become tunnelled visioned and narrow focused. Stress and anxiety, will push you to take action, often when no action is needed. Fear and stress will provide you with a sudden burst of energy to get you moving and to push you into action. But you cannot run away from a traffic jam or if you're late for work, the same applies if you have a deadline to meet. Unless you're running in a race or playing a physical sport, stress is pretty much a waste of energy, and, you cannot perform at your peak best, if your body is tense and stressed. Often we feel anxious if we think that we don't have to confidence or ability to handle or cope with a certain situation. You can start to change this by letting you know that you can handle the attention, pressure or situations and whatever happens you will be OK. Try to eliminate the consequences, take them away, imagine the worst case scenario and see yourself handling the situation well, see yourself not caring or being bothered, then see everything going well. If you want to begin to reduce your stress, then start to change the way you react and change your relationship with time. Sometimes you just have to learn to slow down and break your old stressful and fearful patterns and responses. As you go about your daily life and tasks, if you find yourself rushing and tensing your body, and starting to feel a bit stressed or anxious. Start to interrupt the pattern and stop all the momentum. Momentum is a two way thing, you can have positive momentum going on or you can have negative momentum going on. So, anytime you feel the onset of stress, anger or anxiety building up, just stop and pause for a moment, feel the feelings, and just slow down and allow the feelings to subside. There is no need to do anything other than, relax your body, because relaxation is the polar opposite of stress and anxiety. If you find yourself getting caught up in the feelings and emotions, force yourself to slow down, release any tension. Put your attention on the external world, avoid becoming narrowly focused on your stressful thoughts and feelings. If you have a task to perform, gain back your composure, pause for a minute and focus on relaxing, then deliberately take your time, and gradually and naturally build up your speed. Avoid the urge to rush, grip things lightly, do not tense your body, do not feel as if you need to rush, try to relax and enjoy the moment, even if you don't really like or want to do, what you're doing. Stand and move with poise and grace. You can go faster and be more efficient and productive, by going slower, relaxing and being in control of your feelings and emotions. If others have upset you, practice silencing your ego, for your own sake, try not to allow anybody to annoy you or upset you, you can still stand up for your rights, but try to do it in a calm and assertive controlled energy. Successful people have wised up and mastered the art of not rushing, they relax, enjoy the journey and they try to enjoy every minute, even when things become challenging. If you have a goal, enjoy what you're doing, instead of making it a chore and a fight with your will power. Goals should be fun, so try not to put any pressure on yourself or add any emotional attachment to your desired outcome. When you're feeling relaxed, you will be smarter and you will work and perform smarter and more efficient. People who rush, because they think they will do things quicker or they will save time, usually end up becoming stressed, tense, flustered, and they make a mess of things and actually, don't save any time. If you have already allowed the negative momentum to gather pace, then it is a good idea, to leave what you're doing and go for a walk and just observe nature. Have a good workout and then go and relax deeply, and come back when you're feeling more relaxed and balanced. Relaxation and inner balance are the key to a better life and a better you. When you let go of any negative thoughts, feelings and emotions, then you will start to think clearly and your decision making will improve. The ironic thing is, when you learn to slow down and chill out, you will save energy and you will accomplish more and you will perform better. The trick is to get out of your head and put all your attention on the tasks that you're doing and the world around you. It is OK to think as long as you're thinking, constructive, useful and helpful thoughts or thoughts that have no emotional attachment. Calmness and inner peace come from within, it is something that you have to cultivate and work on. Remember when you were young, where you did not have a care in the world, where time did not matter to you, all you cared about was having fun and enjoying yourself, back then there was no need to get stressed. Has, rushing about or getting emotionally overwhelmed every improved your situation, has trying to resist your thoughts and feelings, ever calmed your mind and body? Have you ever considered that you can get more done and you can make a better job, by simply learning to slow down and enjoy what you're doing. Success is not a race, and what you tend to find, when you rush in is, you do a bad job and you have to start all over again. They say "Time stops for nobody"
This may be true, but if you want to make the most of your time, then you can learn to slow yourself down. By doing this, not only will you get more done and do a better job, you're going to feel a whole lot better for it, as well. What is causing your, problems or for you to feel this way? What can you do to resolve your issues or get the results you want? Asking self questions can help you to find solutions, but try to avoid too many "Why, " types of questions, as they can force you to focus on what you don't want. A better way of doing things would be, to focus on what you want. You haven't got to over analyze and overthink, how you're going to achieve your goals, get what you want or resolve your problems, just focus on what you want, then get yourself into the flow like state of allowing. Combined with practicing to change the way you react to outside events and your feelings and emotions. Then you will start to be able to master your feelings and emotions, grow and solve your problems, which will give you more inner strength. It is essential that instead of focusing on negativity, your bad experiences and your weaknesses, that you put all your attention on to growing and making you and your life better. Dwelling and holding on to your negative baggage, will hold you stuck in a negative place, and it will leave you feeling stressed. It is OK to learn from your bad experiences, to help you grow and become a better you, but apart from that, it is important to let go of your old negative baggage and replace it with positive statements about you. It is important that you put aside your ego and past conditioning so you can get to know the real talented and unique self. If you have made a mistake, embarrassed yourself or you have felt ashamed or humiliated, do not allow it to affect how you think, act do or behave in the future. If you're worried about being embarrassed, made fun of, made the center of attention, feeling anxious, reply to you with, "So what" or " I can handle it"
Or let you know, it is OK if you feel anxious, embarrassed, or made the center of attention. Your mind uses your past experiences as feedback, so only give it positive feedback and don't dwell on or beat yourself up when things go bad, otherwise you will learn to fear those situations. Improving implies that there is something wrong with you, growing implies, that you are making the most of your talents, skills and abilities. Everybody has their own unique qualities, personal talents and abilities and everybody is capable of achieving great things once you let go of your predisposed limitations and beliefs. As you're limitless, there is no end to how much you can grow. A good place to start, is to identify with the area's where you think that you want to grow and get better. This is not about identifying your weaknesses, it is about maximizing your true potential, developing your skill levels and unleashing your creative talents. If you have any emotional or personal problems, admit that you have a problem, identify what you think is causing your problems, and try to find a solution or address your issues. You can get a piece of paper, and divide it into two sections, by drawing a line down the middle. You can list any problems that you have, challenges you want to overcome, goals or any area's of your life that you want to strengthen or grow. You can write down the polar opposites to each problem, goal or challenges, which could be what you would like to change or do, such as your intentions, desires or your aspiration. Once you have your list of what you don't want and what you do want, focus on working on your (A) section in order of importance. Which will be your goals, challenges and any problems that you would like to overcome, and take action to resolve your problems or work on your goal, ambitions or challenges. The single biggest common mistake that most people make is, they focus on what they don't want, instead of focusing on what they do want. They typical approach people take when they have a problem or emotional issue is. They try to fight with it, defeat it, struggle with it, push against what they don't want, believe that they have to try even harder or do more. All this cause negative resistance and emotional attachment, the easy way is to give up with all the struggle and resistance. This does not mean that you have to give up on your goals or efforts to grow, but if you start to care less about the outcome, your problem, your results or what is, and you just go with the flow. Then what you will find is, your problems will dissolve or you will come up with the solution, and things will generally go better and everything will work out for you. Change and growth can only happen, by letting go of any emotional attachment or engagement, and by taking action and implementing new positive habits and better ways of doing things into your daily life on a consistent basis. If you want to be the very best version of you, grow and develop inner strength and resolve, then you have to leave the past behind and keep on moving forwards. Mindset is everything, if you want to grow, be successful or be more confident, you need to have a positive mindset and attitude, always see and imagine yourself internally as you would like to be externally. Create a positive and a charasmatic self image of yourself, again picture yourself being the person you want to be. You can't make it through life without experiencing challenging situations, setbacks to overcome, or disappointment and knockdowns. Life is not always a bed of roses, and everybody faces their own problems, disappointments, tragedies or personal difficulties. You cannot always be full of the joys of springs all the time, life can be tough at times, but you can learn how to dust yourself down and pick yourself up, come back stronger and more resilient. One of the biggest strengths that you can have is the ability to quickly overcome setbacks, hardships or disappointments. Your bad or upsetting experience, can only hurt you once, after that, it is your perceptions and thoughts that you have about the situation, and again, the emotional attachment that causes you all the stress and misery. Your life will be a whole lot better when you cultivate resilience. When you first experience a setback, bad news or you're not getting the results that you want, avoid trying to suppress or thinking that you have to stop feeling like you do. Before you can move on, accept the situation and allow the emotions, upset and disappointments, to happen, so you can process the emotion, learn something new and grow. It is OK to feel upset, frustrated or disappointed, when things go wrong, so long as you don't stay down for too long. Take a break from what you're doing, let the emotion out, and then the next day, see if you can find something positive out of your bad experience, even if everything appears bleak and hopeless. Setbacks and failures can be a good opportunity for you to grow and become a stronger and better you. Let go of any of your negative baggage that you have been focusing on during the day, like all your worries, stress and negativity. Your subconscious mind never sleeps, and whilst you're asleep your mind does all its housework and processing. Night time is a great time to reprogram your mind and to put yourself in a good mood on awakening. Many people go to bed with their minds full of worry and negativity, what this does is, it sets you up for a bad nights sleep and it puts you in a negative mood for the next day. The last few moments before you fall asleep, which is the time between being in a wakeful state and falling asleep, you know, where you start to feel drowsy. Is the best time to release any negative baggage and reprogram yourself to be a better you and a more successful happier you. If you go to bed with your mind full of worry and negativity, you will carry that baggage with you through into the next day, and that same old tiresome process of worry, anxiety, negativity and stress will repeat itself over and over again. To release all your worry, just focus on your breathing and leave your mind alone to think those worry thoughts and let it calm down all by itself, just observe your thoughts and let them freely flow in and out of your mind. Relaxing, just before you go to bed is a great way to prepare yourself for the next day, before you go to bed, name five or more things that you're grateful or thankful for. When your mind has calmed down by itself, as you start to feel drowsy, this is the ideal time to say your positive I am affirmations, like. As soon as you awaken, continue with the positive self talk for a few minutes, if any negativity crops up, just let it come and go peacefully. 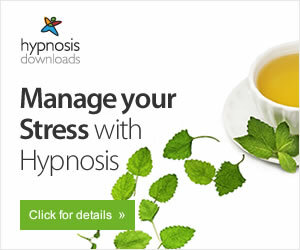 Hypnosis, is a great way to reprogram your mind and help you to relax so you have a good night's sleep. Your all powerful subconscious mind is open to suggestions, and it accepts everything as true, you reprogram your mind through a process of repetition. Your subconscious mind, cannot differentiate between what is real and what is thought or imagined, so if you keep telling yourself something eventually you will become it. If you reprogram your mind whilst you're deeply relaxed, it will significantly speed up your chances of change. The moment as you fall asleep, is when your subconscious mind is most open to suggestions. Work on your feelings, let go of any bad thoughts and feelings and bring in the good feeling thoughts. You have to feel it to be it. Sometimes we think too much, a bit of quality thinking or general thinking is fine, but over thinking or going over the same negative repetitive thoughts is no use. Our body responds to what we give our focus of attention, positive thoughts or thoughts that carry no emotional attachment will help reduce the risks of diseases, help you to feel more balanced and calm as well as promoting feelings of well-being. Leaving you looking and feeling younger and more attractive in your appearance.